March 2016 … I have re-issued the pattern with a few more details and photos … 6 pages will print … perhaps you wish to follow along on an electronic device instead! These are my starter socks for knitters at the studio. I don’t believe too much should be made of tight gauge and what not, learn to knit them and then move on, they will fit. It takes about three pairs of socks until you have it down pat and can knit without the instructions. 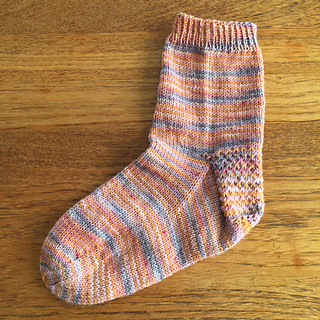 A pair of socks is a lovely project that you can always have on the needles, it is easily transportable and a skein of sock yarn is a painless purchase if you’d rather not take on a big project or are visiting a yarn shop and want to get yourself something! I like plain and simple stockinette stitch socks in self-striping yarns or other hand-paint colors. I leave the patterned socks to those who would thus amuse themselves. I believe handknit socks are like chocolate for your feet. I happen to LOVE chocolate! For those who don’t like chocolate, think of handknit socks as mac’ and cheese for your feet. Comfort food at its best. To me handknit socks are comfort knitting.